Northern Voices: Anarchist Federation Splits! REJOICE – the Authoritarian Fraud has been exposed and the AF come unstuck! Once several AF branches issued an ‘Unauthorised’ statement on the disruption of the 2017 London Anarchist Bookfair we knew they’d be trouble. 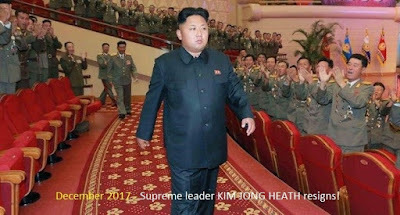 Sharp eyed observers spotted the pronouncement didn’t carry the imprimatur of AF’s Supreme Leader, KIM JONG HEATH and predicted he might press AF’s nuclear button. Admittedly Northern Voices thought he’d incinerate the enemy – those branches and individuals who’d challenged THE PARTY LINE would be expelled but instead the worms revolted and the Supreme Leader along with his entire Politiburo were forced to walk the plank! – Rejoice! This had to happen sooner or later. In the words of 'Monty Python' this devastating split exemplified, 'The violence inherent in the (AF) system' for AF was never really Anarchist nor was it a Federation. In reality, AF was nothing more than a small authoritarian political party, an ideological sect. 'Anarchist Federation' sounds very open and free – not only libertarian, but a federation composed of independent-minded local branches but the name was always a con, chosen for marketing purposes because the reality was deeply unappealing. If we go back to 1980 the Supreme Leader’s sect called themselves the Libertarian Communist Group (LCG) with just 16 members who were regarded by most anarchists as at best, 'Anarcho-Trots'. As if they were determined to rid themselves of the 'Anarcho' part of the label altogether LCG then fused with the Marxist 'Big Flame'! By 1984 this Great Leap Forward had resulted in a party, BF, with a grand total of 17 members! The next move was to abandon 'BF' and create the 'Anarchist Communist Federation', but as this moniker proved equally unappealing the sect adopted the more consumer-friendly but utterly deceptive 'Anarchist Federation'. Anarchism is supposed to be a 'bottom-up' political philosophy, but this wasn’t AF practice. Firstly there’s the Catechism or core of compulsory beliefs and policies, or 'Platform' as they prefer to call it. To join AF you not only had to fully embrace the Platform, but had to have your belief and sincerity tested. Like the Moonies, a couple of party apparatchiks would call on prospective disciples to test out your worthiness before you were anointed with AF membership. In a rare published interview, in 2003, the Supreme Leader, admitted, 'Each member has to agree with our ideas and is met by AF members before they join'. Membership came at a cost, a compulsory levy on your income was demanded. Lapses in regular payment or ideological deviation resulted in denunciation and expulsion. Of course Comrade Nick Heath never referred to himself as, 'The Supreme Leader', he preferred instead to call himself 'Battle Scarred', but as his militancy was confined to a liking for abusive language and a career as a librarian perhaps he meant, 'Battle Scared'. KIM JONG HEATH will doubtless come up with some new mini-political party although, rather amusingly, at the moment he calls his faction, 'Communist Anarchists', whilst his Leicester ex-Politiburo associate names his faction, 'Anarchist Communists' ! A Federation of two. There is a positive role for a genuine, open, bottom-up, 'Anarchist Federation' to play in Britain. Perhaps the faction continuing the title, cleansed of the Supreme Leader’s sub-Marxist faction might fulfil that role but first they’ll have to ditch an awful inheritance of dishonest and authoritarian practice. Thanks for this, though, it made me smile... don't suppose you've had a response from Nick at all. Not unsurprisingly this split in the AF has attracted some unwanted interest from other of the tiny groups claiming their place in the anarchist and communist milieu - from some confused sympathy for the 'Communist Anarchism' element by members of the SPGB to outright hostility towards both sides of the split and plain nastiness from the sectarians of the 'Northern Voices' outcasts, well known for their regular misinformation and lies directed at other anarchists. Not much sign here of cooperatively tapping in to any 'collective knowledge'. Much as I have my disagreements with the SPGB, at least their comments haven't been mean spirited. On the other hand, Northern Voices should really be renamed Poisonous Voices. But I suppose it is the UK anarchist scene's very own pantomime villain... only with extra added batshittery.